Foghat bassist Craig MacGregor died February 9 at the age of 68 following a lengthy battle with lung cancer. 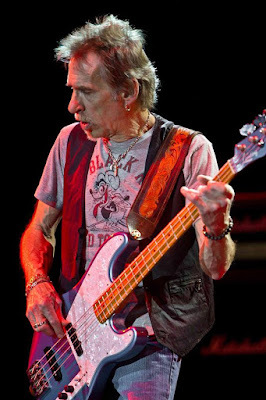 Formed in London, UK in 1971, Foghat scored their first Top 20 hit in their homeland with “Slow Ride” in 1975, a year before the American bassist joined the lineup. MacGregor made his recording debut with the band on their sixth album, 1976's “Night Shift”, during the first of three stints with Foghat. The rocker was diagnosed with lung cancer in 2015; a small tumor was first detected during a CAT scan to check for broken ribs after a fall in 2012 but Torpey was never advised of the issue because radiologists and other diagnostic imaging service providers were not required by law, at the time, to report test results to patients. In the ensuing years, according to Philly.com, the tumor had grown more than 60 times larger, was inoperable, and had spread to the bassist’s brain, which led to the MacGregors suing his doctors and the Reading, PA Health System over their failure to alert him to the health issue. "You get mad and you get scared and you realize that your life is going to change drastically, to somewhere that you never thought it would be," said the bassist at the time. MacGregor became an advocate for the Patient Test Results Information Act, a bill that would require medical personnel to inform patients of all medical test results in a timely manner. Foghat are currently playing dates on a US tour; their most recent studio release is 2016's "Under The Influence."